Here’s what your appointment will be like! This great video FOOTage will take you on a walkabout inside our clinic to see what happens before and during your session. You’ll see what our styles of barefoot massage look like (and no, barefoot massage is not the same thing as foot massage or reflexology!) and you’ll learn about what we have to offer overall, while getting a tour of Heeling Sole’s lobby, massage rooms, and classroom space. We are located at 1864 Nacogdoches Road, San Antonio, Texas, 78209 in the Alamo Heights neighborhood of San Antonio, in the Carousel Court shopping center. You’ll need to book an appointment ahead of time, as we rarely have same day walk-in sessions available. Schedule your Ashiatsu, Ashi-Thai or Fijian Barefoot Massage by calling us at 210.560.1992, or book online! Not sure what to expect from Heeling Sole? Your first visit we’ll have you complete a health intake form. Recurring visits entail a breif check up for paperwork and progress sake. After a thorough health intake with your massage therapist, we will be able to best suit the needs of your session for the day. Knowing a history of your aches, pains, diagnosed conditions, past surgeries, trauma, medications, etc. gives us a safe point of reference to start from. Please read this page on our website regarding if Barefoot Massage is right for you at this time. You must be at least 18 years of age, and weigh over 130 pounds. Texas state massage law dictates that minors may receive massage therapy with the guardians consent and they also state that the parent/guardian be in the same room during the session, however, due to the fact that our massage therapists are at times 2-4 feet off the ground working hard to balance and focus, we do not allow a second person in the massage room as it can be a distraction and a safety concern to all parties involved in the massage. While you undress, we’ll clean, sanitize and warm our feet, and start the session as soon as we return to the room. You are in control of your massage, and we need you to give instant feedback on the pressure level – we are looking for no deeper than the “hurts so good level”, and your comfort is always most important to us. We want almost a play-by-play from the horses mouth as we get to know your muscles and your bodies response to our work. Let us know if it needs to be lighter, deeper, a hair to the left, etc, and we’ll adjust right away! Your feedback does NOT hurt our feelings, it’s encouragement for us to give you the best massage possible that day. Your job during the massage is to focus on your breathing, be heavy, and physically melt into the table. If we try to move your limbs, don’t help. It’s actually better if you are dead weight. So think ~heavy~, be a bag of bones on our table, and we’ll position, stretch or place your limbs exactly where is best for the moment, or if we need you to help, we’ll definitely let you know! Sessions will incorporate as much “massage time” as possible, however, your session may require 5 minutes of pre-session interviewing, post-session follow-up and/or self-care suggestions to better enhance your massage experience. We’ll take the massage right up to the last minute possible, and will let you know when the session is over, so don’t worry about the time. You can choose to end the massage at anytime during the session if it’s not your thing – but we bet you’ll be more likely to want to extend the length of this massage! 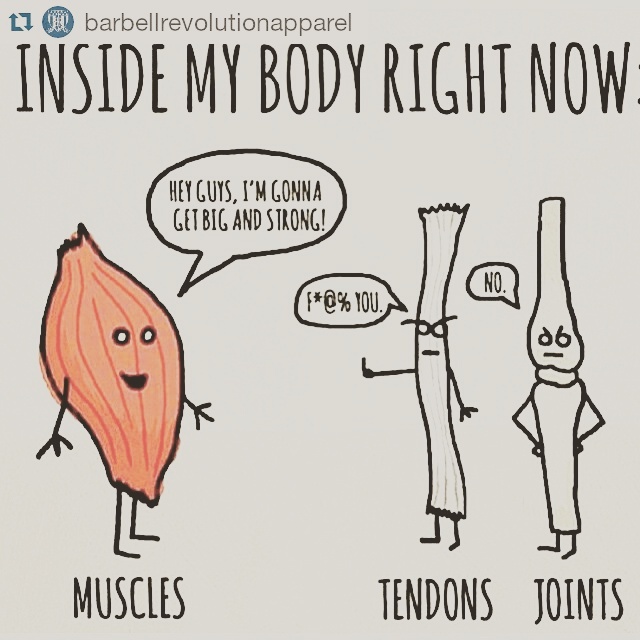 If your tendons and joints are holding you back, come see us at Heeling Sole. We specialize in deeper than deep tissue soft tissue bodywork… so deep that its bone deep. We’ll massage those hard working muscles for you, while simultaneously ~subliminally~ working on those stubborn tendons and joints. 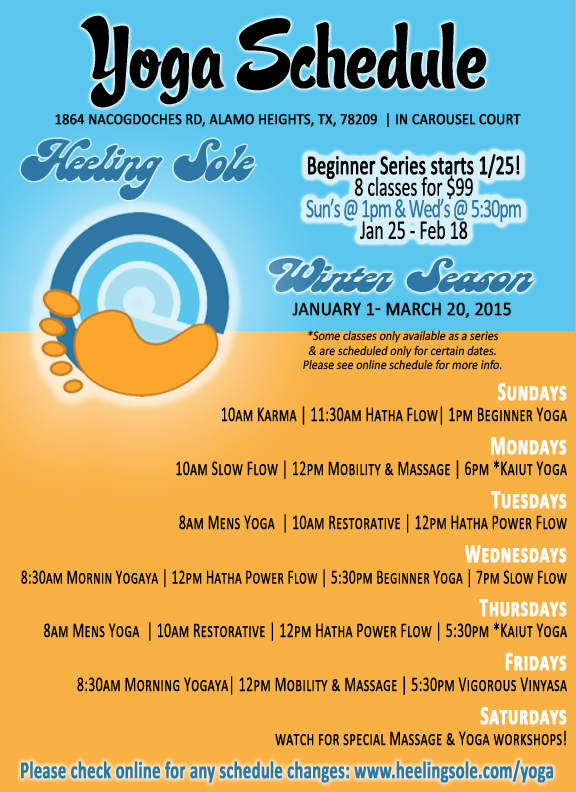 Get your 2015 re-SOLE-utions started off on the right FOOT with Yoga and Massage at Heeling Sole! Based on your requests, our instructor teams availability, and the patterns we’ve seen with our regular students, we’ve added a variety of yoga classes, beginner yoga series, and yoga workshops this year, as well as some amazing massage courses like “Kids Backwalking” and “Couples Massage” for the general public. As always, don’t forget that Jeni teaches big massage workshops once a month, so when those are in session, your yoga moves outdoors! We call them “Walkabouts”, and you can read more about our outdoor yoga in the caves and forests of Alamo Heights here! We’ll list on the online schedule when classes are going to be moved outdoors, if a class had to be cancelled, or if a teacher had to be subsituted, so always be sure to check online, or on our app before you come. 6/7/2014: YOGA DAY!! Saturday morning from 8:30-11:30 we’ll be participating in the Yoga Day event! This is an event put on by a non-profit organization helping to make yoga available to the underserved sector of the population who traditionally haven’t had access to it. We’ll be donating our time to give 10 minute Ashi-Thai, an adaptation of passive yoga, sessions to those who visit our tent, as well as donating massage services to their auction. The yoga class of 500 people starts at 8:30am, hope to see you there! 6/21/2014 : SUMMER SOLE-STICE! It’s our annual summer event to celebrate the longest day of the year! Join us for a break of dawn meditation with Olga, a Sun-Salutation-packed yoga class at sunrise, a 2 hour bike ride led by Bike World, a zippy fun scooter ride led by Vespa San Antonio / The Motorcycle Shop, Ashi-Thai and Pada Mudra Massage sessions with our Barefoot Massage Therapists, Roller derby fun with the San Antonio Mens Derby Countdown City Chaos as well as the kids Jr Derby… a foam rolling and mobility class led by Warrior Spirit Cross Fit, All FREE! Don’t forget to bring some cash so you can enjoy some BEER from Ranger Creek and BRUNCHY FOOD from the Hippie Momma’s food truck. 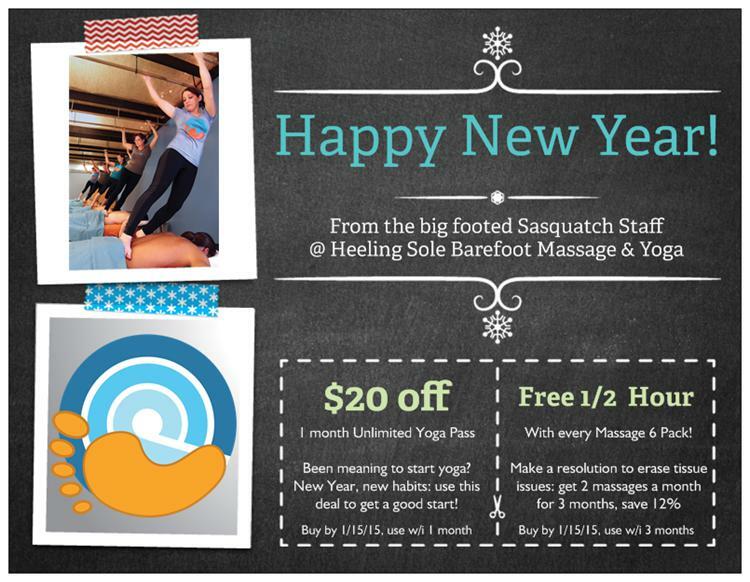 OH, and it all wraps up with a Couples Barefoot Massage Class for $80/couple.